sparky302 had the most liked content! 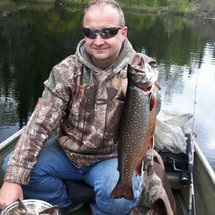 Summer Brook Trout Tips !! 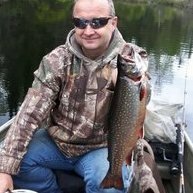 What a day i had again in the canoe fishing brook trout they seem to be feeding and getting ready for the fall.In the video i explain a few of my tricks on catching these fish it can be work but once you figure them out look out !!! I use atv but sometimes its 3-4 trips walking 1/4 mile carrying gear to lake. I use line counter reel and or i will bounce bottom in 15-17 feet and then reel up just a hair to get correct depth most lakes i fish are rock bottom so you don;t need to worry about weeds getting on tackle. Yes i have run the bigger blade gang trolls also as for depth i fish max 30 feet most fish are in the 17-25 ft range.I have gang trolls with orange or with green they both work very well also.As for speed i troll @1,4 to 1.7 mph. Water surface temp was 75 F .I drop temp gauge down and find 52-54 f.I have caught brook trout all times of the day. Thanks i love brook trout !!! yes sir i run a worm !! Well this morning was foggy as you can see in my video with moisture all over the lens on the way into the lake and the humid air made it even hotter in the canoe but it paid off the brook trout were hungry. I live about an hour from Birch Lake it is a good Lake for fishing just watch the regs on the walleye only allowed 1 with a sport licence @19.6 inch and You are not allowed any with conservation Licence. The smallies i have caught up to 22 "
Some nice brook trout up there !!! Nice catch !!!! Thanks guys i enjoy making videos and posting pics.I will also post my 2 daýs from the end of May . What another awesome day i had fishing with my son we did not fish in the kayak or canoe but we back packed into a lake i love fishing and used a boat the heat and the bugs were crazy and it was time to give my son some of my fishing tricks as i don't get to fish with him lots because of his work hours.